Rosacea is a widespread but misunderstood skin condition, affecting one in 20 people. In part two, we look at how laser and IPL treatments can be used to help manage and control rosacea symptoms. Rosacea affects different people in different ways. 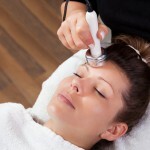 But one of the most common symptoms is facial redness. Frustratingly for rosacea sufferers, there is no known cure for the condition, but there are treatments to help keep symptoms under control and even slow them down. Aside from the oral medications and topical medications we covered in part one, there are two additional methods of treatment: Laser and intense pulsed light (IPL). These treatments are mostly to address the permanent redness and visible blood vessels (known as telangiectasia) of long-term rosacea. Some dermatologists also believe it can also reverse the underlying activity of rosacea. They may also improve flushing symptoms. What is laser and intense pulsed light (IPL) treatment? Laser uses a single focus precise wavelength of light for a targeted response. Whereas IPL uses a broad spectrum of high-intensity light emitted at multiple wavelengths. When briefly aimed at the visible blood vessels in the skin, the heat from the lasers or IPL (photothermal energy) targets and damages the dilated vessels, causing them to collapse so they are less visible. 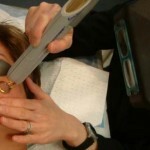 The dermatologist chooses the certain wavelength that is suitable for the patient to get the best results. What are the advantages of laser and IPL? Light and laser therapies have become very popular. The main advantage of this procedure is that there is minimal downtime with high safety margins. The procedure is highly effective in removing visible blood vessels (telangiectasia) and improving erythema. Vascular laser therapy combined with IPL has been proven to reduce facial redness and vessels by as much as 50–80%. Another advantage to IPL and laser therapies is that any area of your body can be treated, including your face, neck and chest. Because it a non-invasive and gentle procedure, there is virtually no downtime and patients are usually able to return to work and continue daily life straight away. In some cases, laser treatment can cause pain. However, the pain is mild and rarely needs an anaesthetic. Likewise, the side effects of laser treatment are mild in most cases. They may include bruising, crusting of the skin, swelling and redness, and in very rare cases: blisters and infection. If they do occur, side effects typically only last a couple of days. For example, any resultant redness and swelling often lasts less than 24 hours. There is no permanent cure for rosacea and nothing you can do to prevent rosacea and reoccurrence after successful treatment. But the good news is modern-day treatments can effectively manage the symptoms to ensure rosacea doesn’t prevent you from having a happy, healthy life. If you want to speak to an expert about rosacea treatment, contact Sydney Dermatology Group.